Planning your big day to match throughout can be a challenging task. How far do you go? Do you want everything to match or only a few core pieces? 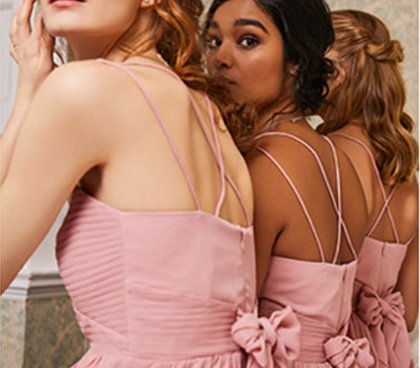 To help, we’ve found four of the best bridesmaid dresses on the high street to perfectly match your wedding stationery. The soft chiffon and organza’s give a romantic edge to any wedding. The fact you could run this luxurious detail across so many aspects of your wedding day is beautiful. This simple yet tasteful invite is quiet a statement as it is isn’t a crowded design but with elegant detail is a dainty and really pretty idea for a design. So why not reflect its simplicity with a dress matching the sophisticated style. This dress is a classic shape with a modern take on details like the spaghetti straps. The small pop of detail at the back with a bow and crossed straps are a very feminine touch to a timeless style of bridesmaid dress. The idea of putting the main features at the back of the dress gives a surprise factor to this gown. And as you and your bridesmaid are walking down the aisle, eyes will be glancing at your front and picking up the eye catching detail on the backs. The uncrowded design is really quiet inspired as its so on trend to be bold and delicate at he same time and these two pieces embody the trend perfectly. The shades of pink and the choice of fabrics are what give these designs such a soft and graceful feel to them. But the bold shape of the bow on such a simple backs gives both these designs such an eye-catching touch to a quiet modest style. Browse over 100 ribbon wedding invite designs. Flowers and floral prints are everywhere this season and wedding wear is no different.These fun and sophisticated bridesmaids dresses are perfect for the outgoing and the low key bridesmaid.The pastel colours of these floral prints compliment the pattern beautifully to show off the delicate detail. The way the invitation opens up to reveal straighter edges reflects the neckline shape on the dresses to give a subtle similarity to both designs. The aspect that works so we for these wedding designs is the pattern only covers a part of each piece giving them a bolder feel with the contrast of pattern and plain. This ensures the detail on both stands out more and becomes more intricate. We’ve seen glistening embellishment on bridal and bridesmaid dresses so why not match it in with glistening invitations as well? A lot of weddings are all about the glamour and the sparkle to reflect shining personalities so its only natural to want it all to tie in together with matching detail. The simple yet elegant invitations include not only a sleek and bold font but a little pop of sparkle in the silver dots. As statement detail is hugely on trend this year we thought why not have a bridesmaid dress which compliments the delicate detail on the invitation. We think this dress is all about the embellishment but isn’t too daring o steal the show on the big day. It’s a dress with a classic shape to compliment all bridesmaids and it’s an elegant design which can compliment any theme as it is a contrast of simple and bold detail itself which shows it can fit with a elegant and a glitzy wedding theme. 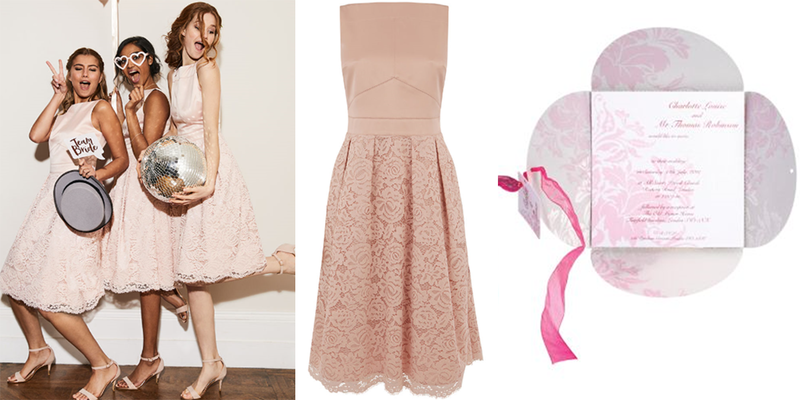 The pop of colour and the softness of the bow on the invitation compliments to colour and gentle fall of the skirt. The dainty silver dots on the invitation carry across to the intricate beading on the dress and compliment each other very well. Colour is coming back in a big way from blush shades to deeper more romantic colours. This dress, we would say, embodies the pop of colour trend down to a t.
The fun pleats give body and drama to the dress and the gathering at the top just gives an elegant shape and a stunning detail. 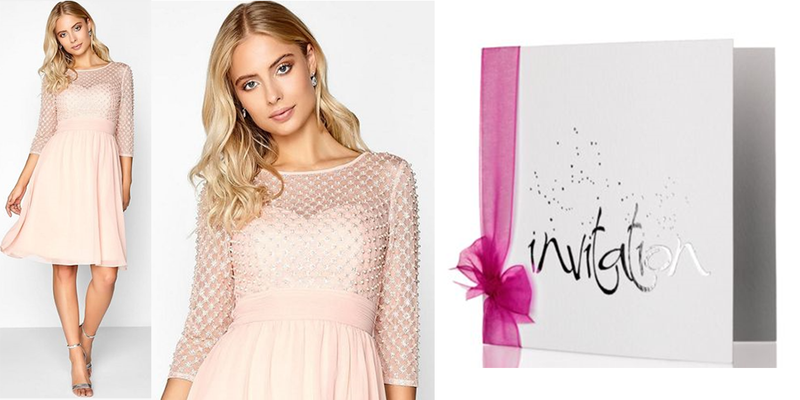 The stain finish to the dress reflects the satin used in the invitation perfectly the rich fabric connect and show off a luscious theme to a wedding. The pleats created in the dress create the look of the satin ribbon to add more detail to the design, and even the way the invitation is folded and presented, we think, echoes the dress effortlessly. The rich pink of both the ribbon and the dress itself will ensure a visual of the running theme between the two pieces. Haven’t decided on a theme yet? Take inspiration as you browse the impressive and varied collections of wedding invites for sale.